Announcing a new addition to The Farming GameÂ® family! This fun children's educational boardgame can be played on three graduated playing levels. An adjustable skills game, it is fun for any kid from the ages 3-9. It can be played in English, French, and Spanish. THE FARMING GAME KIDSÂ® challenges children to get their "hands dirty" in their own fantasy gardens growing crops of apples, corn, eggs, and watermelons. THE FARMING GAME KIDSÂ® is an adaptation of the award-winning classic family boardgame, THE FARMING GAME KIDSÂ® is for the "new generation". It was created by the second generation of the Farming Game family for their own growing young sprouts, some as young as three years old --to give them a chance to try their luck at farming. 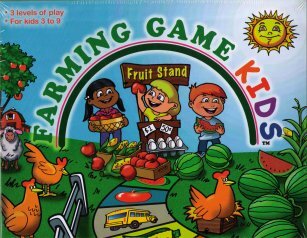 THE FARMING GAME KIDSÂ® gameboard is a working farm, the fields a-popping with produce. Kids harvest the food to sell at their fruit stand. For the little kids, it's the player who gets to the Fruit Stand with the most produce that wins the game! For the older kids, playing FARMING GAME KIDSÂ® at level #2 or level #3, they also get to roll the dice...with their roll determining how much money $$$ the KIDS get paid for their crops! THE FARMING GAME KIDSÂ® helps develop skills in addition, subtraction, counting money, reading simple charts, Spanish, French and...the most important lesson in farming, keeping a stiff upper lip when things aren't going just right...that is...right after you Farming Kids get done laughing! A different spin on a simple board game. Great for kids!